7″ vinyl (split) – Sold out! Pre-orders is now fully booked! Pre-orders of all versions of the 7″ split vinyl with Imperial State Electric / Dead Lord is now fully booked. We don’t take anymore pre-orders. The exclusive gold version is fully booked! Pre-orders of the Imperial State Electric/Dead Lord – Lightning Records exclusive version, gold colored vinyl w/ embossed sleeve, are now fully booked. 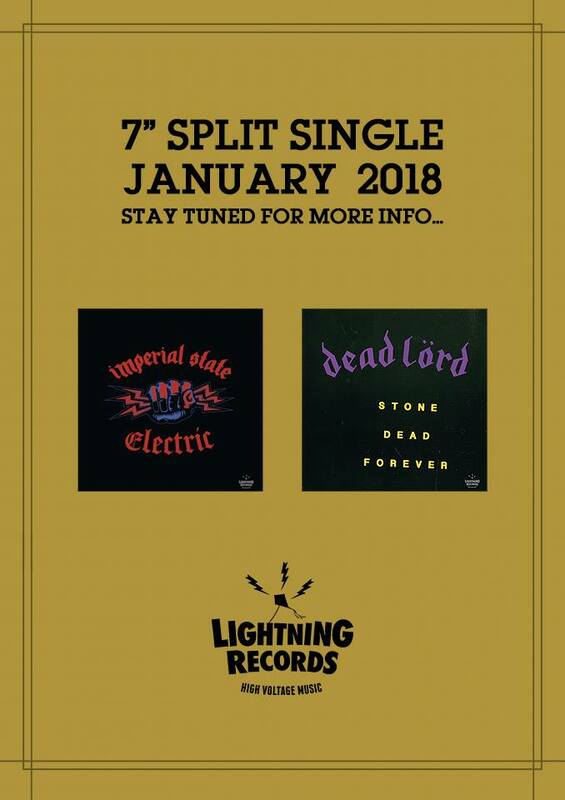 Imperial State Electric and Dead Lord has recorded one Motörhead song each for a 7″ split vinyl. The vinyl comes in black (400 copies), brown (400 copies) and gold (200 copies). The special version in gold colored vinyl with an embossed sleeve can only be bought through Lightning Records. Release date is January 26, 2018. Imperial State Electric and Dead Lord – Celebrating and interpreting Motörhead with one cover each on a 7″ split vinyl single. Release by Lightning Records in January 2018. Stay tuned for more info!